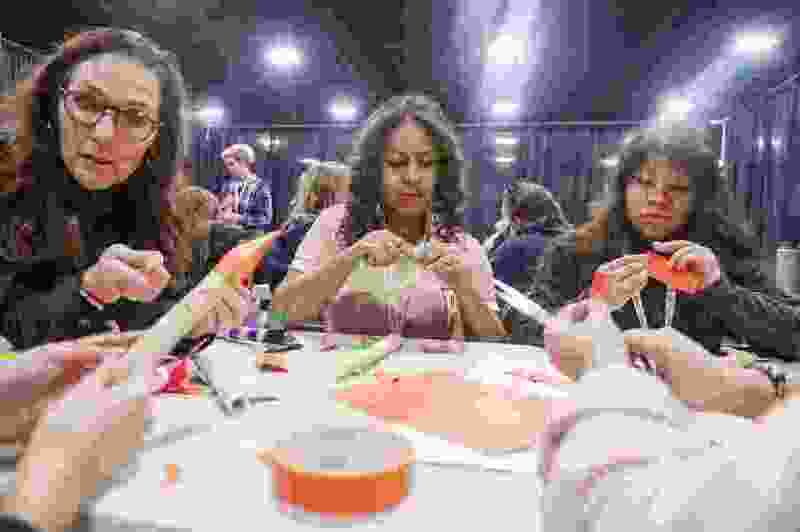 (Leah Hogsten | The Salt Lake Tribune) Students learn how to make a paper rocket in February at a SheTech Explorer Day at the Mountain America Expo Center in Sandy — an event held to help interest girls in science and math. Research from Utah Valley University on the State of Women Leaders in Utah Business found that the small percentage of women in top-level jobs at Utah businesses has decreased in 2014, and the report speculates that could be connected to the number of male leaders who come with Utah’s growing tech industry. The small percentage of women in top-level jobs at Utah businesses has been cut in half since 2014, a new report says — and the drop may be connected to the state’s growing tech industry. Four years ago, women filled 11.6 percent of top leadership roles, including CEO, president and top manager, according to the 2018 Status of Women Leaders in Utah Business report. Today, they fill 6.4 percent of those positions at Utah businesses with 100 employees or more. “Our guess, although we are not certain, is that the influx of tech companies to Utah has brought with it more male CEOs, presidents, general managers (for those headquartered outside the state), corporate board members, and employees more generally,” the report said. Utah routinely ranks at or near the bottom of national equality rankings, based on the low representation of women in government, the state’s pay gap and other factors. Susan Madsen, a Utah Valley University professor who directs the Utah Women & Leadership Project and worked on the report, said research has shown there are fewer women in the state’s science, technology, engineering and mathematics industries. This is due, in part, to a number of social factors that are particularly prevalent in Utah, she said. “We have stronger aspirations of girls and young women here in Utah to stay in traditional female fields, so we see our bigger numbers [of women] of course in education and social work and some of the medical fields,” she said. The top industries with women serving as CEOs were transportation, warehousing, health care and social assistance, according to the report. Utah’s male-dominated industries included mining, quarrying, oil, gas and construction; finance, insurance, real estate and management; and manufacturing. Women’s representation increased in one area from 2014 to 2018, as the 5.4 percent of company board chairs grew to 7 percent. Cydni Tetro, co-founder and president of the Women Tech Council, said a large number of women in the state’s tech industry are leaving for executive leadership opportunities outside Utah. That trend, seen in the council’s data, could have contributed to the drop in women in leadership at Utah companies, she said. “We’re not connecting enough pathways to the opportunities,” she said, noting that one of the council’s major priorities is helping women meet industry professionals who can keep them in mind when hiring. Studies have demonstrated improved fiscal outcomes when more women are members of a company’s leadership team. As the number of tech companies in Utah has grown to around 6,500, with 1,000 of those added in the past 18 months, Tetro said the dialogue around addressing gender inequities has evolved, too. Marva Sadler, CEO of the Utah-based software strategy company Veracity Solutions, said she’s seen a shift in the conversations about diversity over the past two years. Women will have more opportunities in tech, she said, as organizations raise awareness of “unconscious bias and the need for inclusion in order to capture the potential value of all of these highly talented people,” she said. Veracity employs a network of independent consultants but has fewer than 100 employees, so it may not have been included in the UVU data, which showed there were no women CEOs in the technology industry. The 2018 status report shows it’s “very easy to slip” if people stop working toward gender diversity, Madsen said. “We as a state, but particularly leaders of technology companies, need to have these diversity issues at the top of their list and actually work those issues into their strategic plans,” she said. The report advised companies to take a number of pledges and adopt initiatives, such as mentoring programs, to increase gender equality in leadership. One of these is the ParityPledge, an initiative designed by Parity.org that at least 40 Utah companies have joined. Companies vow to interview at least one qualified woman for job openings at the vice president level and higher, including their board of directors. There is no reporting requirement. But those steps are only a starting point, Madsen said. “Then [also do] the organizational things, like looking at your policies, looking at your practices, what kind of designs … in hiring and so forth do you have in place?” she said. Changing culture at the organizational level is one of the most successful ways to create diverse workplaces, Madsen said. “And I have to say it’s not rocket science,” she said. Tetro said she’s increasingly seeing the companies she works with make those shifts, citing Overstock.com’s onsite daycare and health clinic as features that make workplaces more friendly for diverse groups of people. “If you want more diverse talent, you have to make it a really active initiative,” she said. The 2014 and 2018 research briefs were based on an online directory of more than 80,000 business from the Utah Department of Workforce Services, according to the report. That sample was narrowed to firms that had at least 100 employees, and the 2018 results were based on at least partial data from 775 organizations — 497 of which were headquartered in Utah. The report found no evidence that larger companies had fewer female CEOs but did find that companies with greater numbers of employees appear to have more women holding seats on the boards of directors. Over the next five to 10 years, Sadler said, she expects Utah’s statistics to change.